As we continue with our 12-post series on objects in the history of the Temple Mount, let us turn to the Late First Temple period – Iron Age IIb-c, in the 8th through 6th centuries BCE. During this time of the year, multitudes of business owners and legions of accountants spent many a sleepless night filling out forms, checking and double checking their numbers, all as part of a fundamental act to human society – paying taxes. Taxes, in one form or another, have been around since the dawn of history – as soon as complex societies began to form. As long as people lived within small familial farms, they could afford to be jacks-of-all-trades and the same person could farm the fields during the day and guard them at night. But empires, kingdoms and even cities need full time guards and soldiers. And if you’re spending all your time patrolling – you’re not spending it growing food. Since the soldiers still need to eat (as do the judges, priests, rulers, etc. ), food must be collected in the form of taxes and delivered to them. Enter another functionary of society – the clerk – who oversees the collection, storage and distribution of taxes. The item we’ll be discussing this time was left behind by one such functionary. This item, approx. 7x7mm in size is a sealing – a piece of clay, which, while still wet and soft, was affixed to a string used to tie up a rolled papyrus document. Looking at the righthand picture, you may be able to make out the impression left by the string and the strands of papyrus on the reverse side of the sealing. On the left side, you can see the ancient Hebrew letters stamped into the sealing, which, despite two broken letters, can be read as saying Gibeon \ [belonging to the] king. The shape of the letters and comparison to similar artifacts date our sealing to the 7th century BCE. 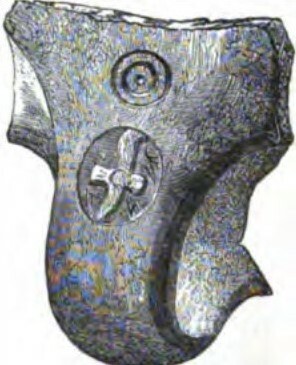 This sealing belongs to a rare group known as “fiscal bullae”. Less than 60 of them were ever published, and until recently – all were unprovenanced artifacts from the antiquities market. This changed in the past few years, with the discovery of this sealing, which was also the first to mention Gibeon. 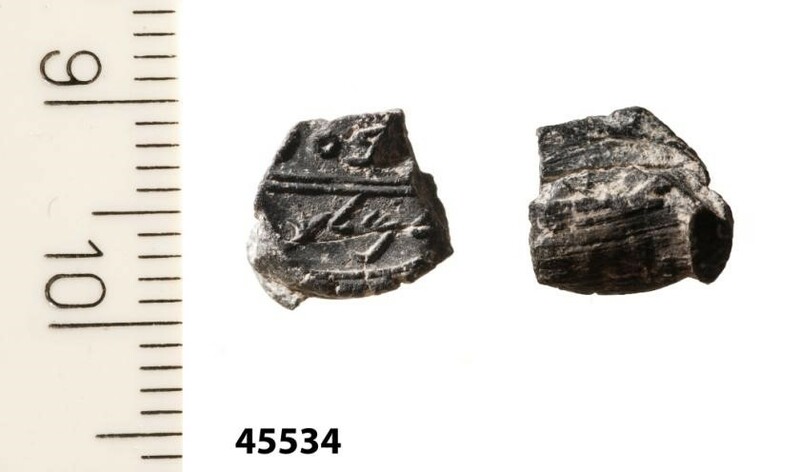 Since then, excavations at the City of David have yielded two more sealings (bearing the names of Bethlehem and Eltekon, a city in the hills of Hebron). Another sealing, unearthed south-east of the Temple Mount, has yet to be published. The date, as measured by years of the current king’s reign (our sealing is broken and missing its top third, so we cannot ascertain its exact date). The name of a city. To date, sealings bearing the names of 21 different towns have been published, mostly matching the list of Judean towns in Joshua 15. The word LMLK – “belonging to the king”. The second group similarly showcased the date, but the 2nd and 3rd fields were replaced by a personal name – probably that of an official. So why are these fiscal bullae so different? The answer lies in that final word – LMLK. LMLK seal impression, discovered by Charles Warren at the foot of the south-east corner of the Temple Mount. Many of our readers probably recognize this word from another type of artifact dating to the late days of the Kingdom of Judah (the 8th century BCE) – the LMLK jars. These jars, found throughout the Kingdom of Judah, bear on their handles a stamp impression comprised of a royal emblem, the word LMLK and the name of one of four cities: Hebron, Sochoh, Ziph and Mmšt. These jars likely represent an elaborate economic system, which oversaw the collection of produce throughout the land via four central hubs. As a taxation system, these jars would likely end up in the royal granaries and storehouses. The Bible gives some insight into the ancient Judean tax system. Most taxes mentioned in the Bible were the kind paid by the sweat of your brow – a period of forced labor, toiling to build governmental projects, but it also fell upon the residents of the kingdom to provide for the monarch. (1 Samuel 8:15-17, 1 Kings 5:7) This was likely done via the tax system discussed above – with local administrators, whose names appear on some of the fiscal bullae and LMLK jars, collecting agricultural produce. The produce – such as grain, wine and oil — was collected in large sacks or earthenware jars. Sealings that were attached to these vessels helped prevent unauthorized tampering. Some of the so-called fiscal bullae, such as ours, were attached to documents such as receipts or bills of lading and still retain the impression of papyrus fibers, while others were attached to nothing at all and served as a token of debts paid. Further information on the Judean taxation system can be extrapolated from similar systems in the ancient Near East: From regional hubs, the taxed produce would be transported to a central hub in the royal compound, there to be received by an official, whose job usually ran in the family. If we are indeed dealing with taxes related to the Temple, it is likely that this person would be a member of the Immer family, of which we know of two members connected to administrative duties on the Temple Mount: one who was a “Chief officer in the house of God” (Jer. 20:1) and the other, whose seal-impression was discovered in the sifting project. An upcoming post will discuss this sealing and what we can ascertain about the Temple treasury. Those of you following this series of posts are already familiar with the royal compound erected on the Temple Mount in the time of King Solomon. Biblical times knew the mountain-top compound and the hill upon which it resided by different names. The terms “Temple” and “Temple Mount” were popularized by the sages in post-2nd Temple literature, but in the Bible, the Temple is mainly referred to as the “House of the Lord”, and the Temple Mount as “Mount Zion“, such as in Psalms 48:3, which describes the royal compound on Mount Zion, north of Biblical Jerusalem (in the Byzantine Period, the name “Mount Zion” shifted to a nearby hill, known to this day by that name). The history of the Kingdom of Judah saw the Temple through some high and low points. The Biblical author has a clear vision of how things should be – the children of Israel worshiping one god in a single place – but constant reprimands against the people and their rulers tell us that this ideal was rarely realized and even when the all-present idolatry was curtailed, the people would still worship in individual shrines, eschewing the Temple. A few kings orchestrated religious reforms, but these rarely had lasting effect, and would need repetition within a few years. Hezekiah reopened the locked Temple doors and reinstituted the Passover sacrifice, (2 Chr. 29-30) and yet, three generations later, King Josiah is said to once again re-institute the Passover (2 Kings 23). And so at the celebration of Sukkot following the inauguration of the 2nd Temple, (Nehemiah 8:17) the festivities are not said to be like any of those seen at the 1st Temple, rather, a comparison is drawn from the olden days of Joshua. Artifacts from this period discovered within the Temple Mount complex are sparse, and insufficient to paint a coherent picture, but some further information can be garnered from items discovered in the sifting. These finds are currently being cataloged, studied and analyzed, and their discussion is beyond the scope of this post. 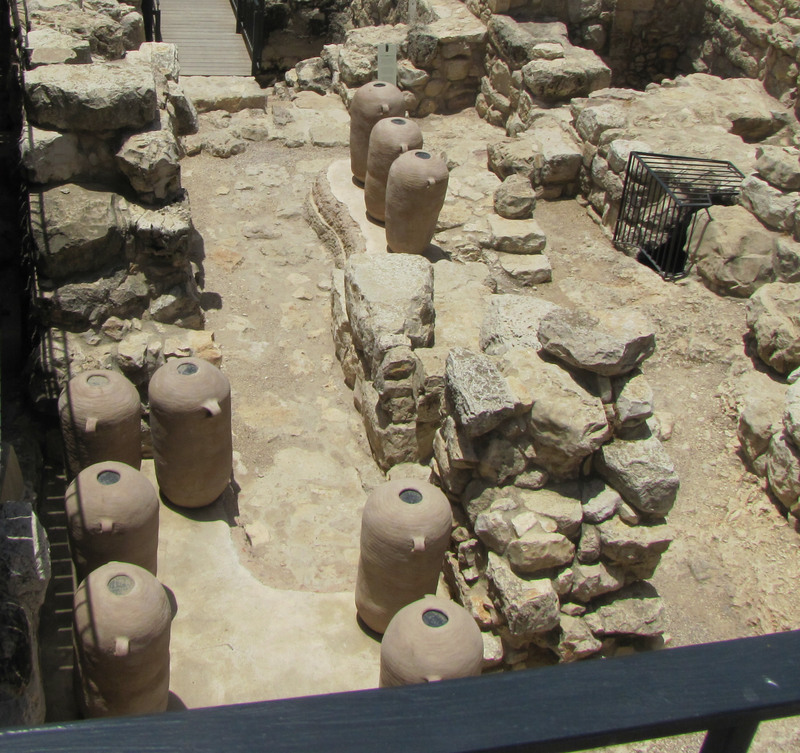 Remains of a royal storehouse discovered in the Ophel excavations. Did similar ones exist in the Temple Mount? but in fact, only a single one was discovered. The conundrum intensifies when nearby discoveries are considered – many LMLK jar handles were discovered by excavators just outside the southern wall of the Temple Mount (including the first ones ever found – once again, by our all-time-favorite tunneler, Charles Warren). But perhaps this very fact points at a possible solution – the administrative center may have been in the southern part of the Temple Mount, possibly even beyond its current border. A significant number of sealings discovered in the Ophel excavations, including one bearing the name of King Hezekiah, gives further credence to this hypothesis. Of course, it is always possible that while the administration took place at the Temple Mount, the actual storehouses (treasuries) could have been in a separate location. In summary, in the Late First Temple period, the Temple Mount complex served as a governmental and administrative center of the Judean monarchs, as well as a ritual religious center. The Temple itself obviously resided within the confines of the modern-day Temple Mount enclosure, but the administrative and palatial complexes are harder to pin down – they could have been included as well within the same area or in the Ophel, below the modern-day southern wall, or could have possibly spanned both areas alike. Did the Temple Mount serve as a pilgrimage center throughout the First Temple period? What was the relation between the worship of the God of Israel and foreign deities within the Temple and its environs? Were there residential buildings atop the Temple Mount? These are only some of the questions to which archaeology may provide evidence that will shed light towards an answer, and we hope to be able to address them as we continue our research. But as of this moment, data from the sifting is still being processed, and other information from the Temple Mount is too scant to support any conclusions. Join us next time, as we delve into the enigmatic Persian period!